We had a chance to interview producer Max Cooper, who in 2012 was voted as one of the top Live Performers in Resident Advisor’s annual poll. When he showed up to DJTT HQ, he excitedly shared the details on a project he worked on dubbed the “4D Soundsystem” – a new immersive sound environment that allows producers to create music that moves throughout the physical space. Watch our interview and hear examples for yourself in today’s feature. When you start to talk to Max, it becomes clear just how excited he is about everything that he’s working on – from his own audio productions to massive collaboration projects like the 4D sound system. Having come from a scientific background (he holds a Ph.D. in computational biology), Max’s attention to detail must prove invaluable when needing to rethink how live performances work – which is exactly what the 4D system required. Created by a team in the Netherlands (4D Sound Group and Bloomfield Systems), the 4D Soundsystem is a grid of 48 omni-directional speakers that are installed around a room to allow the performer to physically move sound around the space. 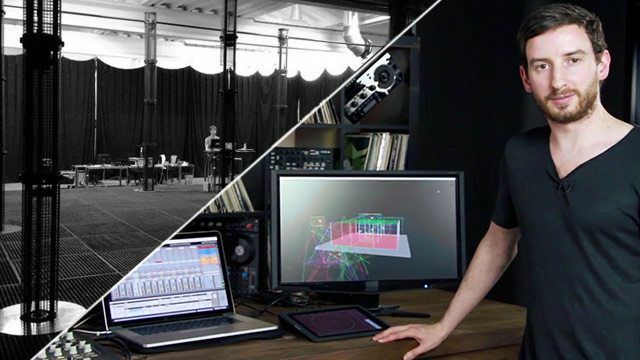 The speakers are set up to use a technique to use an advanced concept called “contiguous phantom imaging”, allowing sound to travel vertically and horizontally in any direction in the space – all with a custom Max4Live patch and Ableton session (and a iOS Lemur template) to control the performance. In the video you get to hear a few seconds of performances that Max was kind enough to let us repost a few of his binual recordings from the event – recorded with two microphones to simulate three dimensional sound – so wear headphones! We’ve also made a few GIFs to remind you of the type of motion in each track. Listen to the audio and try to hear how sounds move throughout the space (these recordings obviously do not quite give the full effect). Learn more about Max Cooper on his official website.